I just cancelled my entire week. No meetings, no events, no appearances, no travel. Instead, I’ve been handed an assignment that will require my full attention. And her name is Sabine. This is our first child care emergency, I suppose. We got late word that Sabine’s regular daily caregiver would have to be out for the week. So, it’s on me. But so far, so good. Right? 8:45am Sabine has been in front of the TV the past half hour watching “The Bible” miniseries on BluRay. (Don’t ask) I’m able to write a few emails and finish writing an article in that time. This calm will not last. 8:55am Been chasing Sabine between the bedroom and the living room. 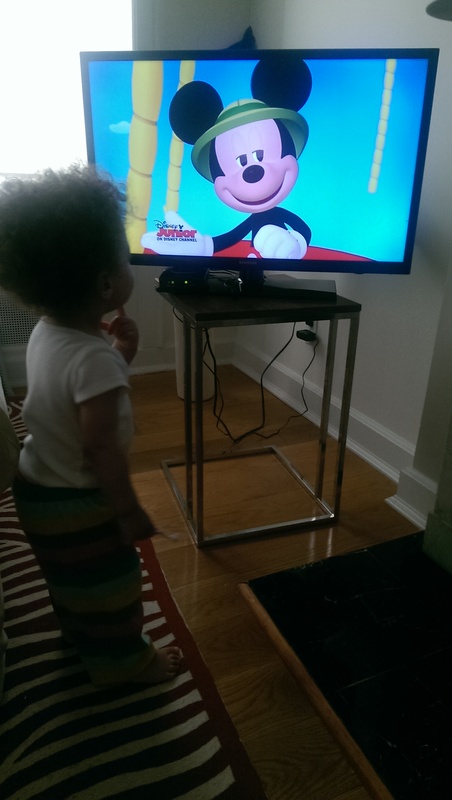 She can’t seem to decide if she wants to watch “The Bible” which is playing on the TV in the bedroom … or Mickey Mouse Clubhouse which is on the TV in the living room. 9:00am If I hear Mickey’s damn “Hot Dog” song one more time, I might actually have a breakdown. 9:23am I just heard the “Hot Dog” song again. 9:35am Sabine attempts a somersault off the couch. She sticks the landing. And to think its only Monday of daddy daycare week! I used to say the same thing. Just wait until you start watching the Disney videos over and over and over again. I am still watching Xmas movies. This time with your daughter is so precious. Savor it, and let her know the world is hers. Hotdog hotdog hot diggety dog we got ears it’s time for cheers… Damn song!